See motorcycles, enjoy free music, and get deals during Wednesday's Bike Night! 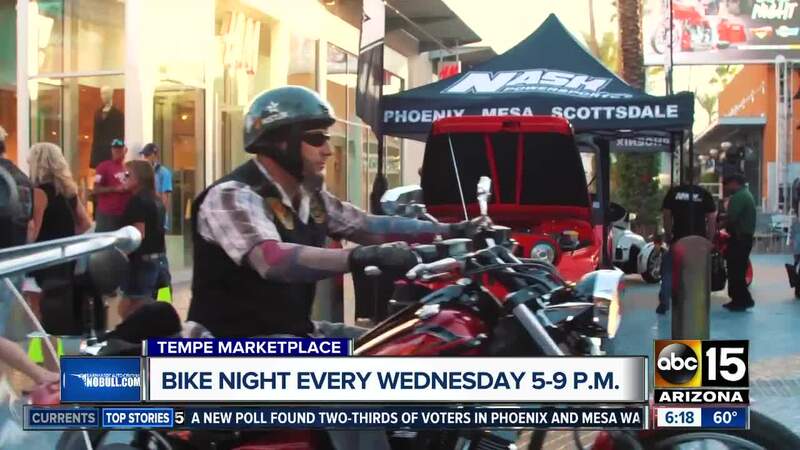 Ride in or just come check out the bikes every other Wednesday night starting April 10 through June 5 from 5 p.m. to 9 p.m.
See hundreds of bikes lining The District Street, enjoy live music, and score deals during that time frame. Auntie Anne’s: 20% off entire purchase. California Pizza Kitchen: 20% off entire bill, excluding alcohol. Dave & Buster’s: Spend $20 on a power card, get an additional $20 fee and unlimited game play on non-ticketed games. Plus, enjoy $3, $4, $5 drinks and $5 bar bites for Happy Hour from 3:45-7 p.m. and during Late Happy Hour after 10 p.m.
Lucille’s Smokehouse Bar-B-Que: $10 off when you spent $40 or more. Nekter Juice Bar: Buy one get one free 24 oz. smoothies. Rocky Mountain Chocolate Factory: 20% off any purchase. Slices Pizza: Two slices and a 20 oz. drink for $6.99. Yogis Grill: Free 5-piece California Roll with any purchase of $25 or more. In 2017, hundreds of thousands of people in Arizona had registered motorcycles. Click here to see more on the statistics . Chances are you know someone who currently has a Class M driver's license. Take them with you to enjoy discounts of the entire bill! That loophole means savings for everyone! Have a roarin' good time!